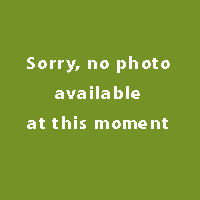 This lovely coneflower has yellow flowers and a brown-black heart. 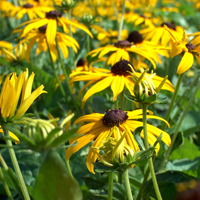 Rudbeckia Fulgida Gold Sturm will be happy in a sunny spot in the border and is an easy and free flowering garden plants suitable for a large group to be planted. 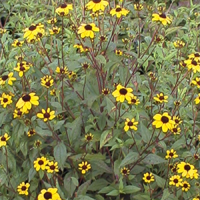 A good choice for a yellow flowering (autumn) border. 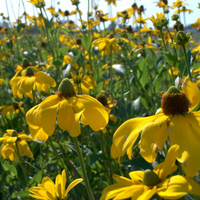 Rudbeckia ‘Little Goldstar’ is a compact, shorter variety that packs a punch when it comes to its flowering capabilities. With its short stature, ‘Little Goldstar’ is a perfect choice for containers, borders, and to use in mass plantings. Large, fully double, lemon-yellow flowers with contrasting green centres that turn yellow as they age. This tall but compact form of coneflower is a perfect back-of-border plant. It is like a sunny spot in the border. 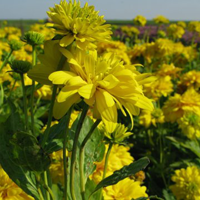 Easily grown in average, medium moisture, well-drained soils in full sun. Tolerates some part shade, but decreased flowering and weaker stems usually occur in too much shade. Best results are obtained in consistently moist, organically rich loams. It appreciates good air circulation. Deadhead spent flowers to encourage additional bloom. 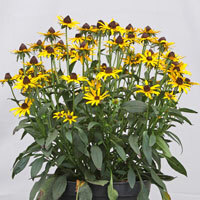 Unlike some other types of rudbeckias, 'Black Beauty' is not drought tolerant. This plant has pinwheels of blooms in glowing colors. The stems are a rich purple-brown that nicely offset the stunning flowers.